We were excited to see our friends waiting for us... an adoption from China includes two weeks of traveling in country, one week in your child's province and one week in Guangzhou to complete your child's US paperwork. Any adoptive parent can tell you that it seems like much longer than two weeks... so much happens, you are changed so much. And then it is done, and you are home. There is relief, excitement, a feeling of anxiousness to get home and settled into your new family routine. We also miss being in China. A lot. 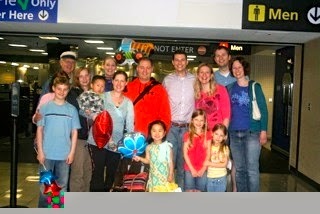 But that doesn't mean we're not happy to be home... we're elated, and beyond happy to see our loved ones and our home. And we're exhausted... we were so happy that we all slept for eight hours after going home, that we thought, just maybe, we would be lucky enough to not be affected by jet lag. But that jet lag is tricky, and we found out that we were wrong when we were all exhausted but wide awake in the middle of the next night, ha! Walking off the plane to see our friends waiting was so special, and everyone was so sweet to rally together so late at night to welcome us home. We celebrated this past week with Chinese food with some friends, and a couple gifts for baby J... I don't think he "gets it," of course, but he was thrilled to be getting presents, and enjoyed telling everyone we saw "It's MY fanimy day!" And we are so blessed to call him ours. Happy Family Anniversary! So many amazing milestones this past year. Wishing your beautiful family a blessed Easter too! I'm so enjoying your posts. It is so obvious that you are crazy about your two little kids. It is refreshing to see someone so enchanted with their children! i'm so glad I found your blog!! I'm just a gram from Portland, Oregon who loves kids, raised a bunch of them, and love reading about you younger ones raising your sweet children.